Innovative valve solutions for over 20 years. As a reliable and committed partner of the aerospace industry one thing is really important to us: The satisfaction and the success of our customers. We develop, produce and sell since 1995 individual valve solutions at the highest quality level for potable water and waste water applications in galleys and lavatories. We are able to fulfill your special needs through the competent, personal and close consultation and our long experience: fast, without complications and reliable. We always have the highest quality on sight but we also always search for the most economical solution. Most modern facilities and ongoing quality assurance guarantee that the highest standards in the industry will be fulfilled. Only experienced technical personnel is your daily contact – in production and individual consultation. 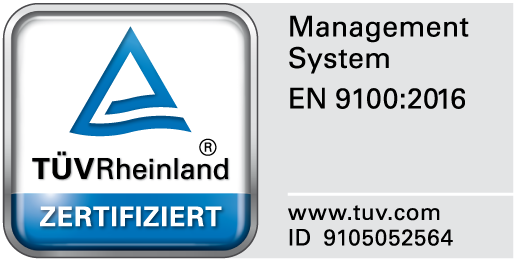 Here you´ll find our certifications EN 9100:2018 (equivalent to AS 9100D and JISQ 9100:2016) including ISO 9001:2015. As an internationally active company, it is important to us that our partners and suppliers also apply and implement our standards in joint cooperation. Our Code of Conduct is a binding guideline for dealing with employees, combating corruption and compliance as well as safety and quality.